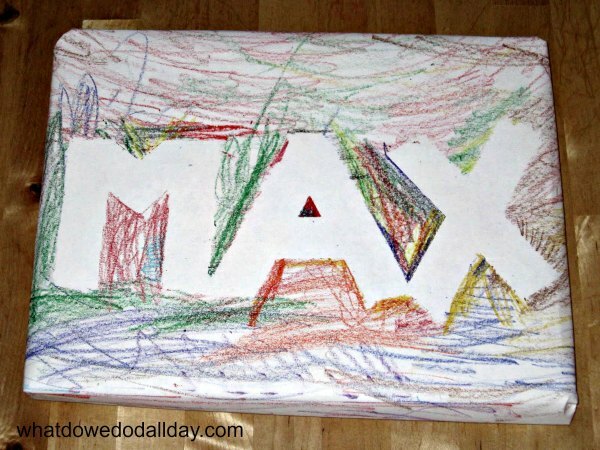 I love to use handmade wrapping paper to wrap gifts and kid made wrapping paper is lots of fun. This tape resist technique is great because it allows you personalize the present and also eliminates the need for a card if you are in a hurry. 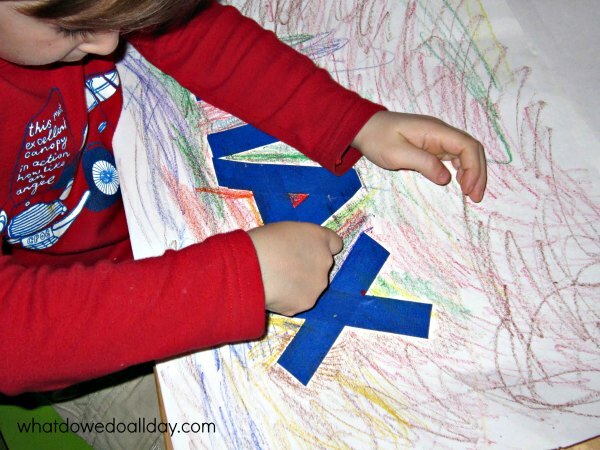 Use low-tack tape (such as painter’s tape) to write the child’s name, initial or age. Madly color and scribble around the tape. Remove tape. Voilà! Needless to say, this technique works best with flat packages such as books or games. If the package is small, an initial or the child’s age is perfect. « Toy Vehicle Play: Ramp it Up! Great idea with using tape to spell the child's name, love it! Fortunately, we are anti-social. We never get invited to anything 'cause we don't actually know many people. No. Seriously. We don't socialize w/ any real, live, living & breathing kids. Sure, we get the invitation to my best friend's kids' birthday parties–but technically, I don't think Ben actually talks to either one of them whilst in their company. Love this! I've been wanting to do some painting with the same technique but crayons will be easier. And we've got a birthday party this weekend to boot!